This healthy salad recipes are perfect for anyone looking to add a little more nutrition to their diet. It is perfect for serving as a side salad or main dish. Carrot salad with raisins is easy to make salad recipes. 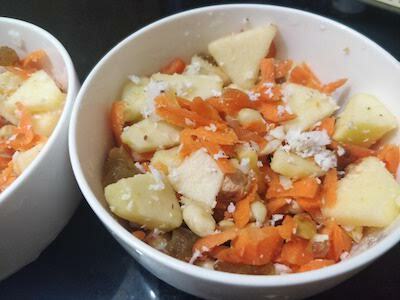 Cut Apple, Carrot, Pineapple and Dates in to small Pieces. Coarsely dry grind the roasted Peanut. Mix all together. Now it ready to serve.